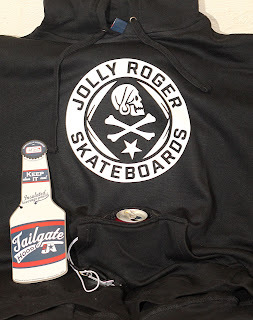 Jolly Roger Skateboards: New JOLLY ROGER Tailgate Hoodies! New JOLLY ROGER Tailgate Hoodies! We just started printing our new JOLLY ROGER Tailgate Hoodies! These hoodies have a built in koozie for those that like to publicly indulge in a Diet Coke every now and again. These hoodies come with an attached bottle opener for those that like to drink Diet Coke straight out of the bottle. We started printing our glow-in-the-dark logo but at this point there is no telling what graphic that these hoodies will end up with. We will be putting these hoodies out on the rack as they are printed so don’t snooze if you want one. Available in Medium - 2X sizes.